After reading some of the "tongue-in-cheek" comments to yesterday's post of my friends Gabe & Kelly Gross, I have posted a new photo that should please everybody. Those who know me best know that I love trails that lead into the woods. Paths that beckon you to "come and explore". 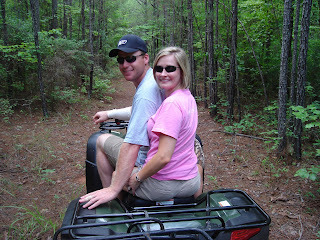 This great shot of my friends shows them heading into the woods on their ATV. Ya' gotta like Gabe's T-shirt! Satisfied?